Social media marketing is an essential part of any internet marketing strategy. It allows you to create awareness of your brand, connect and engage with your audience and start to drive targeted traffic to your website. Have you watched a recorded TV programme and hit the Fast Forward button when the adverts came on? When was the last time you picked up the Yellow Pages to look for a telephone number? Do you get irritated when you answer the phone and it’s somebody trying to sell you something? The old ways of marketing a business are no longer working or at least not to the extent that they once did. It’s not enough to just buy ad space or bombard your potential customers with offers because the reality is, they are not paying attention. They are becoming desensitised to this form of marketing. Customers can be far more selective when it comes to purchasing or selecting a service. And it’s likely that they will purchase from a company that they know, like and trust. So marketing today is about building a relationship with your potential customers. And it starts by understanding where their attention lies. It’s not necessarily with the TV or newspapers. You haven’t got to look very far to find the ubiquitous smartphone and it’s where we’re spending a disproportionate amount of our time. Whether it’s keeping up with friends and family on Facebook or Messenger, watching videos on YouTube or interacting on Twitter, Pinterest, Instagram or (for the younger generation) Snapchat your potential customers are there. 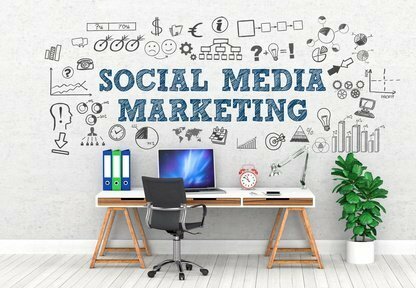 Social media marketing starts by joining in with the conversations that your potential customers are having. Deliver value within those conversations. This provides the opportunity to build trust and familiarity with your business or brand. Please call on +441277 552040 or click the button below and fill out the contact form and I’ll get back to you.